Plague is an infectious disease caused by the bacteria Yersinia pestis, a zoonotic bacteria, usually found in small mammals and their fleas. It is transmitted between animals from their fleas. Humans can be contaminated by the bite of infected fleas, through direct contact with infected materials or by inhalation. Plague can be a very severe disease in people, particularly in its septicaemic and pneumonic forms, with a case-fatality ratio of 30%-100% if left untreated. The pneumonic form is invariably fatal unless treated early, is especially contagious and can trigger severe epidemics through person-to-person contact via droplets in the air. There are two main clinical forms of plague infection: bubonic and pneumonic. Bubonic plague is the most common form and is characterized by painful swollen lymph nodes or 'buboes'. Plague is an infectious disease caused by the bacteria Yersinia pestis, a zoonotic bacteria, usually found in small mammals and their fleas. It is transmitted between animals from their fleas. Humans can be contaminated by the bite of infected fleas, through direct contact with infected materials or by inhalation. Plague can be a very severe disease in people, particularly in its septicaemic and pneumonic forms, with a case-fatality ratio of 30%-100% if left untreated. 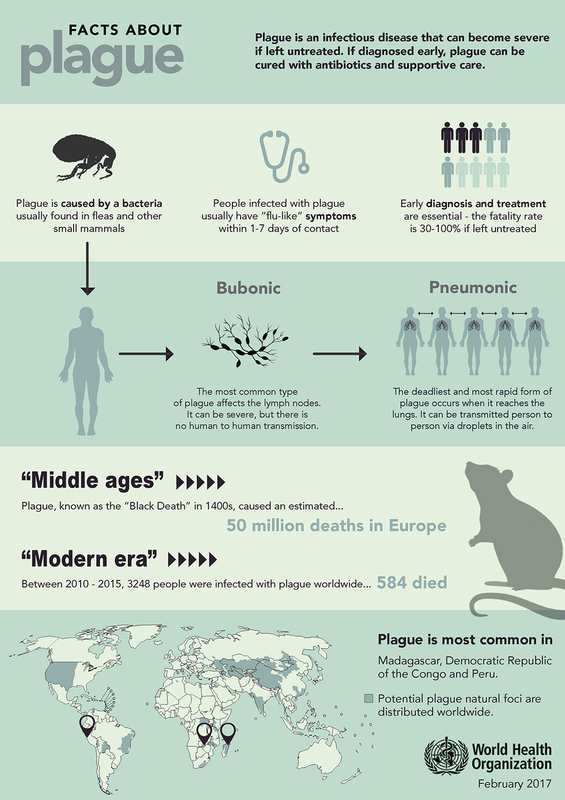 Bubonic plague is the most common form of plague and is caused by the bite of an infected flea. Plague bacillus, Y. pestis, enters at the bite and travels through the lymphatic system to the nearest lymph node where it replicates itself. The lymph node then becomes inflamed, tense and painful, and is called a "bubo". At advanced stages of the infection the inflamed lymph nodes can turn into suppurating open sores. There is no inter human transmission of bubonic plague. Septicaemic plague occurs when infection spreads through the bloodstream Septicaemic plague may result from flea bites and from direct contact with infective materials through cracks in the skin. Advanced stages of the bubonic form of plague will also lead to direct spread of Y. pestis in the blood. Pneumonic plague-or lung-based plague- is the most virulent and least common form of plague. Typically, the pneumonic form is caused by spread to the lungs from advanced bubonic plague. However, a person with secondary pneumonic plague may form aerosolized infective droplets and transmit plague via droplets to other humans. Untreated pneumonic plague has a case-fatality ratio close to 100%. Confirmation of plague requires lab testing. The best practice is to identify Y. pestis in a sample of puss from a bubo, blood or sputum. A specific Y. pestis antigen can be detected by different techniques. One of them is a Rapid dipstick test, which was validated in the field and is now widely used in in Africa and South America, with the support of WHO. Untreated plague can be rapidly fatal, so early diagnosis and treatment is essential for survival and reduction of complications. Antibiotics and supportive therapy are effective against plague if patients are diagnosed in time. Preventive measures include informing people when zoonotic plague is present in their environment and advising them to take precautions against flea bites and not to handle animal carcasses. People, especially health workers, should also avoid direct contact with infected tissues such as buboes, or close exposure to patients with pneumonic plague. Based on the available information to date, the risk of international spread of plague appears very low. WHO advises against any restriction on travel or trade on Madagascar based on the available information. International travellers should be informed about the current plague outbreak, the fact that plague is endemic in Madagascar, and should receive advice on prevention, post exposure chemoprophylaxis, and where to seek medical treatment should they develop plague related symptoms. Read the full travel advice here.